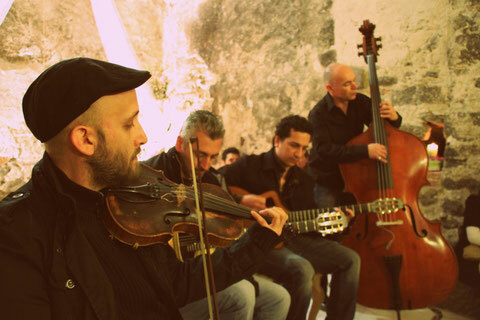 Am Ketenes Swing plays Jazz Manouche, also known as Gypsy Jazz or Gypsy Swing, and are first and foremost inspired by this musical style’s creator and master, Django Reinhardt. AMKS also integrates other rhythms in its musical repertoire, such as Gypsy bossa, waltzes, Eastern European Gypsy - Romani - music and traditional songs. Through their music and songs in Romanès (the Sinti’s or Manouches’ language), they wish to pay tribute to the musicians who have had a significant influence on the direction their path has taken, from Schmitto Kling to Dorado Schmitt.